Festivalgoers from all over the Mid-South will be in Brownsville, Tenn., Saturday, October 17, for the 12th annual Hatchie Fall Fest. The event has grown to attract more than 9,000 attendees during the family-friendly celebration that includes kid’s games and activities, cooking contests, live music, arts and crafts and lots of food. New to this year’s festival is a ventriloquist show for the kids and a Blues battle. The event opens at 10 a.m. and continues through the evening on the town’s historic court square. Entertainment for this year’s event will feature music from many genres including traditional and contemporary gospel, country, rock and blues. Among the entertainers are Brownsville’s own Haywood High School Show Choir, Concert Choir and Girls Chorus. These young entertainers will take the stage at 10:30 a.m. and 1 p.m. Other Brownsville performers will include The Barnetts, Alina Woods, Clifton Smith, Bryan Hayes, Roses Unread, Loose Endz and headlining the evening will be Mickey Utley. Jackson’s Linzie Butler and Dave Thomas will also perform, along with Memphis’s Emma Webb Band and the 11-year-old rock wonders known as Under the Radar. New this year is the addition of the West Tennessee Blues Society’s Battle of the Bands. Three solo/duo acts and four bands will compete to represent the society at the 2016 International Blues Challenge this January in Memphis. The competition will be held on the stage of the Brownsville Amphitheater. This will be the inaugural event for the new stage located on South Lafayette St., and will include a ribbon cutting at 1 p.m., followed by the Battle of the Bands. The Funny Dummy Show will make its first appearance this year in the Kid’s Zone on North Washington Ave. Ventriloquist Ken Karter and his cast of characters will entertain the children during two shows at 1:30 and 3:30 p.m. Along with great music and food, festivalgoers will enjoy browsing over 100 arts and crafts booths and local merchant sidewalk sales. The Frozen T-shirt Contest is back, as are the Pet Show and Blessing and everyone’s favorite Cake and Pie Baking. TIWF wrestling will also be making a return appearance at this year’s festival. 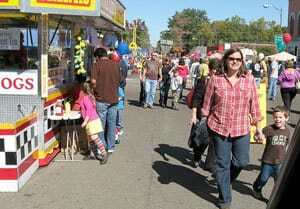 The Hatchie Fall Fest is held annually on the third Saturday of October in Brownsville, Tenn. Admission to the festival is free and open to everyone. For more information and a complete schedule of events, visit www.hatchiefallfest.com. (Photo above): Over 9,000 festivalgoers from across the mid-South attend the Hatchie Fall Fest in Brownsville, Tenn., for a day filled with arts and crafts, fun foods, contests and live music. The family-friendly event is planned for October 17 beginning at 10 a.m. Admission is free.